New Delhi: India and Afghanistan on Tuesday agreed to deepen strategic cooperation, with India consenting to train more Afghan police and military personnel to help the war-torn nation build its security forces ahead of a 2014 deadline for the pullout of international troops. The deepening of India-Afghanistan cooperation comes as US-led forces, weary with their decade-long stay and facing mounting casualties due to a resurgent Taliban insurgency, are looking to exit and Afghanistan’s neighbours, including Pakistan, are seeking to increase their strategic influence. The pacts were signed in New Delhi in the presence of Afghanistan President Hamid Karzai, who is on his second visit to India this year, and Prime Minister Manmohan Singh. 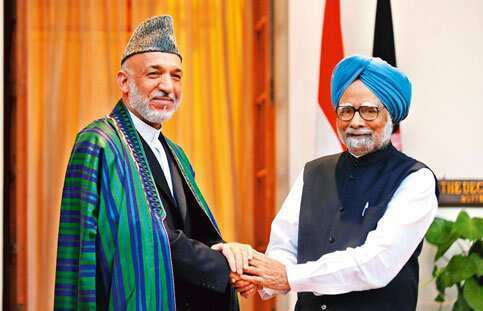 Describing India as “a steadfast friend", Karzai said Afghanistan will benefit from India’s expertise in various fields. The strategic partnership agreement said ties between India and Afghanistan will be “based upon the principles of sovereignty, equality and territorial integrity of states". It is “not directed against any other state or group of states". Besides a dialogue between the national security advisers of the two countries, “India agrees to assist, as mutually determined, in the training, equipping and capacity-building programmes for Afghan national security forces," it said. “The fact that Afghanistan has finally agreed to such increased training, which has been discussed bilaterally for ages but not implemented due to Kabul’s own reluctance, shows the start of a bilateral strategic partnership," said Rahul Roy-Chaudhury, senior fellow for South Asia at the London-based International Institute for Strategic Studies. “Training of Afghan police and military is the key requirement for the planned transition to Afghan security forces in 2014. In view of the large numbers required to be trained and the constraints in Western capacities, India is making the point that it is a key player with long-term interests in Afghanistan," he said. A handful of Afghan military personnel are already being trained in India. “We will do whatever the Afghans are comfortable with. Any increase in the numbers of those trained will be incremental," said an Indian official, who did not want to be identified. “All the training will take place in India," he added, referring to Pakistan’s concerns about India’s increased influence in Afghanistan. India and Pakistan have for decades vied for influence over Afghanistan. India saw its influence decline rapidly when Pakistan-backed Taliban forces took control of Kabul in 1996. Since the ouster of the Taliban in November 2001 following a US-led invasion, India has been working hard to shore up goodwill among Afghans, with a slew of low-profile development projects, pledging $2 billion in aid and assistance. The India-Afghan accord comes against the backdrop of a spike in violence across Afghanistan, with Islamist groups such as the Taliban and the Haqqani network—both suspected to have the backing of Pakistan’s military spy agency, the Inter-Services Intelligence (ISI)—targeting places such as Kabul. On 20 September, a suicide bomber posing as an envoy from the Taliban assassinated Burhanuddin Rabbani, head of the Afghan high peace council. The Karzai administration has pointed its finger at Pakistan for Rabbani’s assassination, a move that is fraying already uneasy ties between Pakistan and Afghanistan. Reports quoting a statement from Karzai’s office soon after Rabbani’s killing said Karzai had decided to work closely with the US, Europe and India to plan the country’s future. “The India-Pakistan equation vis-a-vis Afghanistan is a zero-sum game," said Anit Mukherjee, a defence analyst at the Institute for Defence Studies and Analyses, New Delhi. “Certain elements in Pakistan will definitely view with suspicion any increased India-Afghanistan cooperation in training of personnel." According to former Indian foreign secretary Lalit Mansingh, “Previously, India’s role in Afghanistan was always filtered through Pakistan’s sensitivities... Now, both the US and Afghanistan want us to play an increased role." Some of the 30,000 additional troops that US President Barack Obama sent to Afghanistan in 2009 have begun leaving the country, and the bulk of the remaining troops are likely to leave by 2014, leaving Afghan security forces in charge of the security of their country. The two other agreements will bolster economic cooperation between India and Afghanistan, said another Indian official, who also did not want to be identified. Besides studies to map out reserves of natural gas, India will train Afghans to exploit hydrocarbon and mineral resources, said the first official cited earlier. “We both agree that Afghanistan’s economic integration with the Indian economy and South Asia as a whole is in the national interest of the people of Afghanistan, and one of the ways to achieve this is to promote closer trade, investment and transit links," Prime Minister Singh said. Aman Malik contributed to this story.